Consumer reports has just endorsed the all-new 2014 Subaru Forester as the best small SUV in it’s class. See what small SUVs didn’t pass the grade. The all-new 2014 Subaru Forester has been getting plenty of accolades lately but maybe none are bigger than the one Consumer reports has just given the new crossover. The small SUV segment is the fastest growing category in the auto world and there is fierce competition not only in the U.S., but around the globe. Now Consumer reports has rated the new Forester higher than any other in the class. What did Consumer Reports find out about the new Forester that made them score it so high? When Consumer Reports first received their test Forester in March, they were initially afraid that Subaru “would screw up the 2014 Forester.” After all, the Forester has some core values that they didn’t want to see changed. But Subaru stayed true and kept the Forester’s good visibility, cargo carrying ability and versatility. The secret to Subaru’s success is that they stick to the basics and then they improved on those core values. 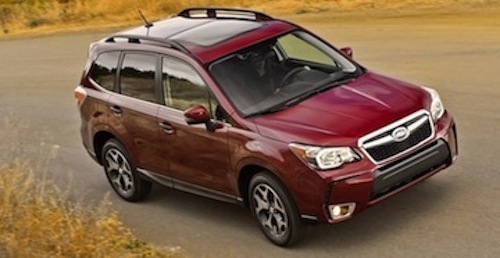 Even in the redesign, Consumer Reports scored the new 2014 Forester above all the rest. What small SUVs did it outscore? Consumer Reports said, “This new Forester embodies the saying “a steady pace wins the race.” The revamped 2014 model light truck won praise from the non-profit magazine for “space- efficient design, large windows, and big square doors.” Those and other features helped it outscore the new Ford Escape, Honda CR-V, Toyota Motor Corp.’s RAV4 and Mazda Motor Corp.’s CX-5. In this competitive segment, the Forester and RAV4 have been battling for the top spot for the past decade. “If you’re looking for a small SUV that’s very functional and fuel-efficient, the Forester is hard to beat,” Jake Fisher, director of auto testing at Consumer Reports, said in an e- mailed statement. The magazine also said the Subaru model has quicker acceleration and leads competitors in fuel economy. Many automakers are moving towards a more contemporary design with sloping rooflines and SUVs that look more like sport coupes. But those designs take away from the core values that customers like about the Forester. The new Forester focuses on the fundamentals with a space- efficient design, large windows, and big square doors. That recipe has resulted in the easiest access and the best view out of almost any vehicle, and one of the roomiest rear seats in the class, with copious head and leg room. And Subaru must be doing something right because they seem to be attracting new buyers to the brand. Praise from the influential publication comes after Subaru's Japanese parent company, Fuji Heavy Industries Ltd., this month said it will invest $400 million to boost U.S. capacity by the end of 2016 as demand rises for its vehicles including the new Forester SUV. Will the strategy continue to help Subaru grow? U.S. Subaru sales for Fuji Heavy Industries Ltd. (parent company of Subaru) rose 17 percent this year through April, the biggest increase among Asia-based carmakers. Compact SUV and sport wagon sales are up 15 percent to 1.05 million units in the first four months, according to Autodata Corp. Subaru is healthier and stronger than ever. Recent redesigns of the new Ford Escape, Honda CR-V and Toyota RAV4 have kept things shaken up in the small SUV class. But the new Forester and its redesign has “left it alone at the summit with its competition far below.” Consumer Reports said its review of the new 2014 Subaru Forester will appear in the magazine’s July edition.